In Bill & Ted’s Excellent Adventure, Keanu Reeves was good-natured dimwit, who traveled through time to meet some of history’s most renowned personalities. In Point Break, he was an FBI agent. In The Matrix, he showed the world that he knew kung fu. In Man of Tai Chi, Reeves shows just how much he loves kung fu and martial arts movies. Not only does Reeves star in the film, he makes his directorial debut here. 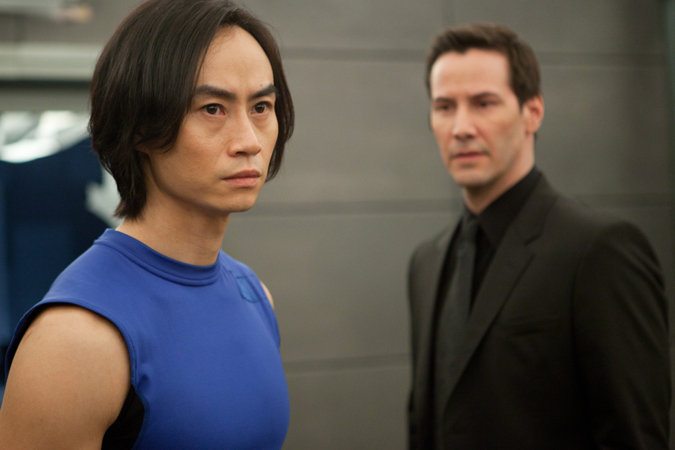 The lead protagonist is Tiger Chen, a stuntman and martial arts expert, who worked on the Matrix sequels and helped train Reeves. Here, Chen works a meager job as a courier while practicing Tai Chi. Against his master’s (Yu Hai from Shaolin and Tai Chi Master) wishes, Chen participates in tournaments to do away with the stereotypes of senior citizens in the park. His success draws the attention of millionaire Donaka Mark (Reeves), who offers Chen the opportunity to attain easy wealth by fighting for him. Chen refuses until his master’s ancient temple is threatened by opportunistic developers. He learns too late that the underground fights are illegally broadcasted with cameras following him everywhere as part of a twisted reality program package. As the fights get increasingly brutal, Chen gets further and further away from the principles of Tai Chi. Fans of Asian cinema will recognize Karen Mok as a dogged detective determined to bring down Donaka’s operations and Simon Yam as her superior officer. Rap artist the RZA paid homage to the classic Shaw Brothers films of the 70’s with his passion project The Man with the Iron Fist. With Man of Tai Chi, Reeves and screenwriter Michael G. Cooney have created an action flick that feels cut from the 90’s era of Hong Kong cinema. The plot is minimal and the dialogue is laughable, but those elements are almost always secondary to the fight scenes. Luckily, Reeves has enlisted the services of Yuen Woo-Ping, the legendary choreographer of The Matrix and Crouching Tiger, Hidden Dragon. The fights in Man of Tai Chi aren’t mind blowing in the manner of Drunken Master II or Once Upon a Time in China, but they are entertaining enough. Reeves has wisely done his homework when it comes to shooting martial arts and surrounded himself with an experienced team. Man of Tai Chi falters in the third act. Iko Uwais from The Raid: Redemption is introduced for the penultimate brawl. Just as you settle in for a knockdown, drag-out match, Reeves takes a left turn and the whole thing fizzles away. Reeves positions himself as the big, bad and faces off with Chen in the climactic battle. Let’s just say his fighting style is as stiff and robotic as his performance. Reeves rarely plays the villain and his turn as Donaka manages to be wooden and brilliant simultaneously. He doesn’t muster a lot of emotion, but there’s a sense of camp to hear him spout dialogue straight out of Mortal Kombat (“Finish him!”). At one point, Reeves randomly stares into the camera, bares his teeth, and snarls as if he were channeling his Devil’s Advocate co-star Al Pacino. Chen gets his first starring role in Man of Tai Chi and while he has the fighting skills down pat, he doesn’t have the acting chops or presence to really be a compelling hero. The video is presented in 1080p with an aspect ratio of 2.40:1. The Blu-ray sports a pristine transfer with strong black levels and natural skin tones. Minor details like the wrinkles on an actor’s face or clothing shine through. The audio is presented in DTS-HD Master Audio 5.1. Dialogue comes in crisp and clear while the fight scenes feature thunderous punches and kicks. The Blu-ray includes an audio commentary track with Keanu Reeves and Tiger Chen. The participants are somewhat low-key and there are a few gaps of silence. Reeves is the talker of the pair as he discusses the cast, the crew, and the fights. The Making of Man of Tai Chi (7:52) is a standard EKP featurette that goes into Reeves’ directorial debut, Yuen Woo-Ping’s choreography, and the story development. Wong Kar-Wai mixed the grace and philosophy of martial arts to better results with The Grandmaster. Gareth Evans directed one of the most action-packed martial arts movies in years with The Raid: Redemption. 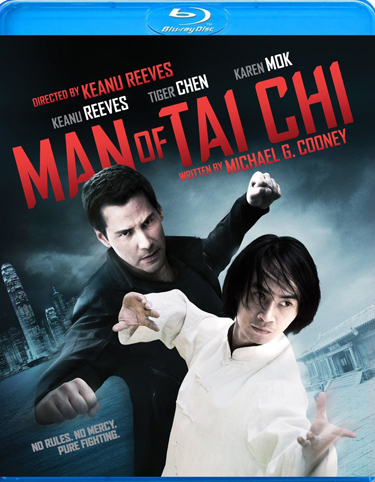 Keanu Reeves’ Man of Tai Chi lands on some comfortable middle ground, but never reaches the heights of the films it emulates.